In leaving Decin, Czech Republic we simultaneously closed a couple of chapters. Last year we left a rainy Decin by train with our tails between our legs as we escaped the rising flood waters; this year we left on our bikes with our heads high, the way we had previously expected to leave the city. And Decin was both our last stop in the Czech Republic (CR) before crossing the border into Eastern Germany and our last stop in Eastern Central Europe after more than 2 months across that invisible line. We savored the more dignified parting with Decin and looked forward to greater ease in our daily life that would come with “being back” on the other side of the line. Even a year after the floods the informal high water marks caught our eyes as we pedaled along the rough-surfaced bike path: clumps of grasses and scraps of plastic bags still hung in the tree branches high over head. The sense of the raging waters’ power is retained by uprooted and almost uprooted trees that are all pointing downstream. And we wondered too if the occasional silt mat on the asphalt and cobble trails was last summer’s river bottom or the result of the winter’s erosion. It’s an eerie feeling to ride along realizing that all around us, including 10’ of the tree canopy overhead, was under water 13 months ago. With our arrival in Decin we had gotten the hoped-for weather reprieve--the rains stopped and warmer weather returned, helping us out both during the day and in the sun-warmed hotel rooms at night. We thanked our practice session for reviving our cold weather routines and happily shed the long johns and cold weather skills for easier living for our trip into Eastern Germany. It finally happened, the casualness at the border crossings reached a new level—we crossed from a non-EU country (CR) into the EU (Germany) without even a nod from a border guard. We saw the usual border crossing buildings across the river and watched the motorists, pedestrians and cyclists all going through the control process but our bike path on the opposite side of the river had absolutely no border crossing—it was like moving between EU countries. Talk about a permeable border…. We wondered if there was a video cam somewhere above us on the look-out for guns dangling out of bike trailers or some other eye-catching situation. Bill’s best guess was that they were mainly screening for truckloads of goods eluding tariffs and not so concerned about individuals or small quantities of merchandise. But I found myself shaking my head in disbelief for hours afterwards in these days of heightened border security due to the threat of terrorism and illegal aliens. But our attention was soon shifting to the other markers of crossing the border. On the German side crews were busy cutting and stacking the smaller chunks of flood debris, with the larger pieces like whole trees having been cleared along ago. On the Czech side of the Elbe River, a full range of debris was still evident. On the German side, the walkers, hikers and bikers in the recreational region were gaining in numbers whereas they had a small presence on the Czech side. And the relative sumptuousness of the German small towns compared to the Czech ones was startling. We’d seen flowers here and there in the CR but now in Germany there were even flower boxes on the small ferry we took across the river. Being back in Germany made TV viewing more possible than in the CR, even with our varying abilities with the German language. But I must say we both choked the first time “Hogan’s Heroes” came on the screen. Even though the show’s regular cast of Nazi characters is belittled in the program, it seemed a little too strange to be watching it in Germany. It must be a hit though ‘cause they show 2 programs back to back and it was on a number of different nights. Moving between the EU (European Union) and the Eastern Central European countries always feels like we are crossing a significant boundary—a boundary that separates countries with markedly different economic, political and social experiences in the last 50 years. We see the differences immediately in the visible prosperity, the quality and variety of food in the markets, the apparent healthiness of the middle-aged and elderly, and often in the general cheeriness of the people. But crossing into the former East Germany from the former eastern block countries is more like crossing a dotted line rather than a solid one--Eastern Germany is an odd mix of the old communist world and the West German “wonder economy” of post WWII. 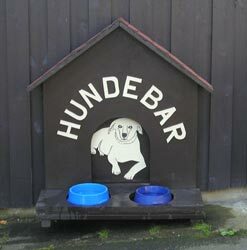 Something for the dogs to enjoy. Our first couple of stops in Eastern Germany were in very westernized villages. I suspect tourism money had catapulted their entry into the new Germany after 1989 as they were as tidy, cheery and charming as we expect German villages to be. And the well worn sightseeing paths to the old fortress in the sandstone formations ended in the inviting, traditional West German outdoor eateries which included something for everyone to enjoy. And a way-cool earth mover for the kids to operate. But a little farther down stream towards Dresden, beyond the draw of the scenic hiking areas, the Eastern Central European (ECE) look of the communist era still held its grip in Eastern Germany. In one town there were vacant shells of buildings a block off the town square and flood-stripped facades with no repair efforts in sight reflected the chronically struggling look that is so familiar in ECE. Disintegrating buildings and crumbling old stone walls lined the main road out of town. And yet the dotted line between east and west has created an over lay on the old look. In one day in Eastern Germany we would see the number of folks in wheelchairs that in ECE we saw in 1-2 months. Over and over again accessibility has proved to be an interesting, though not straight-forward, marker for the affluence of a society. Clearly the rapid upgrade package that the West German’s delivered to East Germany included accessible sidewalks and public transportation. Our first stop in Dresden was visiting a top-notch bike shop for some much needed repairs. Bill had slipped in a ‘boot,’ a strip of old bike tire, between his rim and inner tube to keep his latest split rim from slicing the inner tube. Experience with the even bigger crack in his rim last year in Turkey gave him confidence that he could make the 2 day ride into Dresden with the boot. Fortunately, he was right. Though unlike in Turkey, if the rim had gotten worse we easily could have hopped a train to our destination. So, a brand new rear wheel was first on the list of needed parts. In addition, we both got new middle chain rings to replace the ones so worn that gear teeth had snapped off. New rear tires and new chains for both of us and new rear brake pads for me topped off our Santa’s wish list. It was great to spend a day and a half sightseeing while someone else made all those repairs more quickly than Bill could have done. And we loved the long-forgotten smooooth shifting that our new middle chain rings gave when we got the bikes back. But most of the sights of Dresden slipped through our figures again. Last year it was seeing the flood waters raging through the train station doors on our TV in Decin that prevented our visit. This year we got in little more than a day of sight seeing before we discovered that we had mistakenly planned a day visit to our East German friend’s home when they were expecting us for a week. Bill’s still not sure how that major miscommunication occurred though the exchange was in German. But regardless of the source of confusion, Dresden is back on the “next time” list again. The 5 nights we spent at our German friend’s home in a small town on the Polish border were delightful but intense as all the exchanges were in German. And much to Bill’s surprise, our first evening began with a champagne toast announcing that we were now using the ‘du’ form. Bill was so taken aback that he carefully clarified the point even after our friends repeated the announcement several times to make sure they were understood. The German language, unlike English, has different conjugations for every verb depending upon whether you are speaking to someone in a more formal relationship or in a closer friendship (or to a child). Each and every verb has a slightly different word in each of the 5 tenses for formal and informal relations. And the proper use of these 2 different forms is taken very seriously by most Germans. Bill had been very careful to speak to our friends in the more formal form, knowing that since they are a bit older than us that it would be for them to indicate when and if they deemed it appropriate to switch to the more familiar ‘du’ form, as it is known. So, if speaking German day and night with our friends wasn’t taxing enough, Bill then had to add a new challenge by dusting off these verb forms he dutifully learned but never uses. But what a special and memorable opportunity to stay with them: we felt honored and very lucky to have been invited into their home and to be so warmly received. Never before have we had such an opportunity to see a region from the insider’s perspective. They were both born shortly before WWII and the stories of those times and how they shaped their community are still fresh in their minds. Before the war, part of their town was across the river. But the end of the war brought a redrawing of the borders of much of Europe, including the eastern part of their city ending up in Poland. Much of both parts of the town were leveled during the fighting and all of the bridges across the river were destroyed by the fleeing Nazis. The drama of those times became more vivid for us as we walked along the river one evening and listened to their stories. Our friends were generous in sharing their past, their home and paying our way as they showed us the regional sights. They were effusive in telling us about their lives in both the defunct DDR (East Germany) and in the new, unified Germany. For us it went far beyond a social visit—it was also a crash-course in history. So often when we travel we wish to hear the stories behind what we are seeing and this visit was a unique opportunity to do just that. Our education about brown coal strip mining in Eastern Germany began our introduction into both the geology and economics of the region. Additionally our study of brown coal served as a means of learning how differently things were done in the DDR versus in the unified Germany after the Wende, “the change.” (Its pronounced “ven-da”). Brown coal, which is one of the more polluting forms, lays seductively a mere 230’ under ground in much of Eastern Germany. Once the foot of topsoil and deeper sand layer are removed, there is a 40’ thick layer of coal to be scooped up. There are multiple coal beds, each of which run for dozens of miles. Much of the horrible pollution and environmental damage done in Eastern Germany was from burning this easily harvested soft coal. The massive scale of the brown coal strip-mining operation. Our friends took us to several different vantage points to see the massive equipment involved in strip mining, the devastated environment that is left behind, and an entire town soon to completely disappear as it lies in the path of the earth gnawing equipment. It was an awesome sight to see the huge scale of the mining and the equipment used and chilling to understand how many towns have disappeared in its path. It was also curious to look out at massive covered piles that are buried coal processing byproducts that are being stashed for future use as building materials. The byproducts are also currently being used but the supply outstrips demand hence the giant storage project. I was surprised that the strip mining has continued under the umbrella of the environmentally conscious Germany but the new governing bodies have brought many changes to the industry. Under the DDR, the people, buildings and the land were continuously coated with the pollution that belched out from the coal-burning electric plants. Now, the old smoke stacks are being dismantled as they have been replaced by intensely filtered towers that release mostly steam. Under the DDR, the torn-up land was left in the wake of the mining and blowing sand often filled the air; under the new regime the churned earth is sculpted and quickly replanted to minimize the blowing sand and increase the usability of the land. Under the DDR ancient, glacier-transported boulders were blown up; now the boulders are given away or used in newly created parks in the devastated area. Under the DDR, whole towns of dislocated people were poorly compensated for the loss of their homes and perhaps lifestyles; now new towns with new homes built to the owner’s specifications are created. There is no attempt to trivialize the environmental devastation of this mining method nor about the pain of the loss of centuries old churches and homesteads, yet the civility level of the process is vastly improved compared to how it was managed under the DDR. A reconstructed wooden 1000-1200 year old fort. The bright side of this shocking mining process is the archeological finds that are literally brought to light. No doubt huge numbers of finds are irreversibly lost, but there is an attempt to salvage the ones seen. 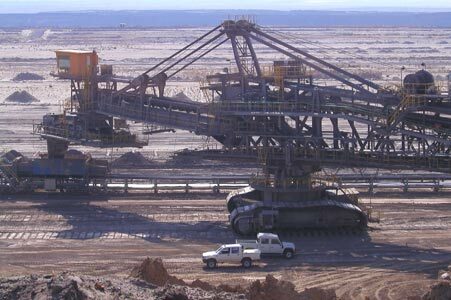 When a machine operator suspects that bits of an historic site are being torn-up, he will halt the progress of the massive equipment and move the mining operation to another area. Archeologists are called in and begin a more careful digging in the area. Numerous 1000 year old communities have been discovered in this process that otherwise would have remained hidden. We visited a reconstructed wooden fortress and the museum built within it to see many of the archeological finds uncovered by the strip mining. This fortress and museum (plus the mural in the next photo) are several of the many historic projects that have been developed in the area since the Wende—the kinds of presentations that the cash-strapped DDR could not finance. 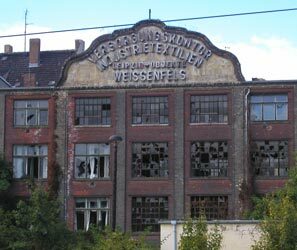 The textile industry had a long and proud history in Eastern Germany beginning in the mid 1800’s. The region flourished and prospered with not only the manufacture of fabrics but also of the machines used to make them. Before WWII, the area was burgeoning and wealthy from this important industry. But this was an area of intense fighting between the Soviets and the Nazi’s and there wasn’t a lot left after the war—either homes or industry. 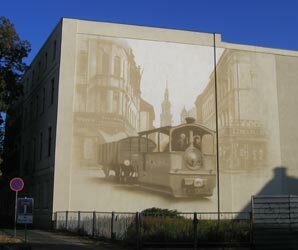 Mural of an urban factory train in a textile town. The communist’s packed up most anything of value that survived the war and moved it to a nearby, larger city. (The prized city rose garden would have been moved too but was spared because it was too difficult a project and not much was left of it after the war--what foliage remained was stripped for food in the immediate post-war years.) Some of the local textile industry was revived, but the community never regained its wealth or stature. The communist era brought textile production under the eastern block 5 year plans and quota systems and the USSR was the primary buyer of their goods. One of the shortcomings of the DDR was that is was constantly short of cash, so despite some boom years in the 1960’s, they lacked the capital to modernize their industries. As a consequence, productivity slowly dropped farther and farther behind that of the west. We were stunned to see antique-grade equipment from the textile industry that was still in use up until the Wende in 1990. The textile industry was nothing to brag about in Eastern Germany just before the Wende but it was decimated by the Wende. The ancient equipment and low productivity could not continue in the bigger, more competitive world. Their most important customer, the USSR, literally disappeared as an entity and as it was mired in its own economic chaos, it was no longer buying. Before the Wende 3000 people were employed in the textile industry in one town and after the Wende, only 40 people still had jobs. Jobs in many industries throughout eastern Germany disappeared for several reasons after the Wende. One was the massive exodus of capital to the west: people desperate to get out packed up and took their companies with them. Some of the better Eastern Germany companies, like one of the beer brands, was purchased by the West and the operations were relocated there. The west was the ‘happening place’ and business people knew that their opportunities for growth were better in the west where there was more money in people’s pockets. 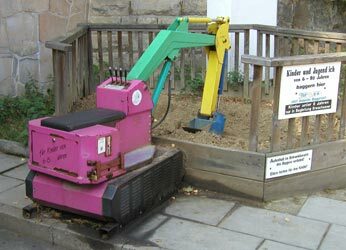 Another major factor in the regional depression was the horribly obsolete machines in service in the east. And I suspect the reputation for low productivity and a culture of guaranteed employment discouraged western-based firms from investing in the east. The spiral down in Eastern Germany was like that in Oregon timber towns or any other single-industry region: the local industry crashes; the jobs disappear; and the people who can, escape to the large cities (and in Germany, especially in the western part of the country). In one community we visited the average age is now 60 years. The people that stay behind are the ones that feel trapped, either because they can’t liquefy their most important asset—their home--or because 1 family member still has a good job. Our friends heavily invested in remodeling their home in the brief boom years after the Wende and now cannot sell their house for a price that reflects that investment. In most places where an industry suddenly disappears, it only affects a region and there are other industries in adjacent areas that keep the entire state or country from collapsing. But in Eastern Germany and other eastern block countries, this industrial obsolescence and economic collapse scenario played out over and over, with little left to sustain the former country. An abandoned textile factory in central Germany. Most world economies have been gradually shifting from being heavy industry and manufacturing driven to being more service-oriented but Eastern Germany and the other eastern block countries were faced with making the change overnight. It’s not been a pretty process and it is not yet complete. Most expect that it will take decades before Eastern Germany catches up with its western counterpart. The economic depression in our friend’s town is somewhat hidden from the visitor by the influx of infrastructure improvements funded by the wealth in the west. The new or newly remodeled hospital, fire station and town center all add to the look of a robust and prospering town. And the federal government has been funneling money into historical preservation projects that just didn’t occur in the DDR. One such project was a great display of the equipment from the defunct textile industry which included our guide briefly operating the deafening machines for us. And yet a block back from the main street there are the disintegrating carcasses of what is left of their once flourishing textile industry. Many of the apartment buildings are half or completely empty as there are no jobs for the people who once lived in them. Even our friend’s home had a story to tell. Newly built in 1939 in the flourishing community near the textile industry, it managed to survive the regional destruction in WWII. But the end of the war found the family taking in ethnic Germans being forced to leave the now nearer Poland. The family home was housing a different family in each of several rooms for 5 to 6 years after the war. The home was remodeled once during the DDR years and a second time after the Wende to replace the low-quality materials used in the initial remodel. Keeping up a home in the DDR years was an ongoing struggle. Tile for a bathroom or a sack of cement for repairs had to be requested from the city government months in advance. Enough material for the job would never be received and so the difference would be made up on the black market at higher prices. And of course, in a process like that, trying to get all the tiles in an identical color was next to impossible. Obtaining supplies for the simplest home repair was a burden. It was a tough decision to keep their home during the DDR years. Apartment living was comfortable and heavily subsidized by the government. They felt that they had to work 10 times harder to maintain a home. Homeownership meant shoveling 8 tons of coal into the basement each year and maintaining a septic tank. There was no running water in the house until 1962 and all the water used was hand pumped and then hauled into the house. At one point the DDR government was going to confiscate all the homes and charge the owners rent. Fortunately, public protest prevented that drastic move. Their enormous lush and beautiful garden blends seamlessly with that of their neighbors to each side. In the DDR years it was almost entirely dedicated to food production, with only a small number of flowers grown. In addition, a separate field was used for their annual potato crop. Now several sitting areas, a small fish pond and ample flower beds are artfully blended with the smaller vegetable plots and fruit trees. Their bulging freezer and shelves have the look of people accustomed to putting away large quantities of food. Home grown and home made plum and apple strudels from the freezer and strawberry, plum and other berry preserves from the shelves quickly made their way to our daily table. Home produced sauerkraut, spicy zucchini conserves and other regional favorites are also readily at hand from their larder. They do bulk buying of meats on sale at the supermarket and a season’s supply of bottled apple juice is purchased from a neighbor. Fresh eggs are bought every few days from another neighbor. And I can imagine that potatoes from the farmer’s field across the street will be purchased and stashed away for the winter. As in some other countries and regions we have visited, an industrious and self-sufficient attitude towards food production has been an essential means of maintaining their quality of life. And in an area such as the DDR where fresh produce could only be purchased once or twice a week (and was hauled home on a bicycle), self sufficiency was the key to good nutrition. Seeing how our friends buy fresh, high quality food from sources without a store front emphasized our problems as travelers in buying food. For us, if a region’s markets close early Saturday afternoon and don’t open again until Monday morning we just can’t buy any food. But local resident’s of an area aren’t completely shut-out like we are—they can still buy things like eggs, some produce, and perhaps bread from unsigned, back-door business that we don’t know about. Unlike some, our friends have no regrets about the disintegration of the communist government and their release from imprisonment in the eastern block world. But despite the decades of hardships, they do have some good things to say about life under the regime. One of the upsides of the most tightly controlled society in the eastern block meant there were essentially no street-drug abuse problems in DDR. As they described it, not even a mouse could sneak across the borders. And the inexpensive sport clubs and other after school activities kept kids’ active and out of trouble while both parents worked. The heavy emphasis on sports produced many exceptional athletes. But they are disappointed to see that many of the athletes trained in the east bolted for the west with the Wende and with them went the loss of recognition for those accomplishments in the east—another blow to the prestige for their part of the new, enlarged country. They also feel that the narrow gap in wealth between the rich and the poor in the DDR made for a better social environment than exists today. However, one of the glitches in the DDR system was caused by subsidizing the housing prices. Housing at one point was ranked as the cheapest in the world at $1-2 per month for an apartment with all utilities included. That was about 10% of a family’s monthly income. A very nice, large apartment would cost $2-3.50 per month. The artificially low rent was intended to make the communist form of government look like a success but had the unexpected effect of encouraging people to abandon their homes—homes which they could not maintain because of both the high cost of and shortage of building materials. The low wages in the DDR were compatible with subsidized products like apartments, with the monthly wage for a factory worker being about $15-20 and accountants earning $40 per month. Fifty dollars a month was considered a very good wage and a factory boss might take home $150. In contrast, products, like coffee, that weren’t heavily subsidized by the government cost $4 per pound or 20% of a factory worker’s income. Our friends waited 14 years to receive their first new car which had a sticker price of $1100, plus they had to pay an additional $25 under the table to receive it. The cost of the poorly built, horribly polluting new car was several years’ wages for the average family. Over and over again my mouth dropped at hearing about life in the DDR as so many ordinary things were distorted. There were high walls built around the airports because the citizens were not allowed to look at the airplanes. In the DDR the watch word was that ‘people made mistakes but the government never made mistakes’. Predictably, protecting the perfect track record of the government required editing history, which included keeping events like the crash of a government airplane near town out of the press. And then there was the coercion of all the state employees so they would march in the workers day parade for the grand reporting of the joyous event on TV. Getting in trouble with the police had a range of consequences. An instance of extreme punishment occurred when a 17 year old girl disappeared into the Soviet prison system for penciling in a beard on photo of Honecker, the DDR head of state. And everyone knew that if a spouse escaped to west that the spouse left behind would be imprisoned and any children placed in an orphanage. It seems that the connection with three generations of their family is what sustained our friends through those trying decades and continues to be a source of deep contentment in the midst of the current economic chaos. Our East German friends were frustrated for decades by seeing on TV what the West German’s had that was out of reach for them. They spent the better part of their lives making do with few and poor quality goods. After the Wende, that all changed. Suddenly they had access to all the food and goods that they wanted but now could not afford them without working extra jobs, which they did. The lack of cash with which to enjoy their new freedom was only one pain however. They were disheartened to learn that the West German’s didn’t really understand how they suffered in the DDR, to learn that they were viewed as second class citizens, and to learn that too many westerners viewed them as weak for not overthrowing communist rule. We were stunned at hearing that Nazism had lead to a second large group of people being as being perceived as weak for not crushing oppressors. Like at Auschwitz where we heard that many Holocaust survivors later living in Israel were criticized for being weak in not breaking out of concentration camps, the East Germans were also being belittled for being too passive under the post-Nazi thumb of the Stasi. It seems incredibly odd to us that we, as people far removed from these situations in both space and time, have no trouble understanding the risks and consequences in fighting back. Both of these oppressive regimes figured out that punishing the innocent is a better deterrent than punishing the perpetrators of resistance. Fighting back didn’t just mean risking your own life but it might trigger the punitive killing of hundreds of others who had no part in the act of resistance. Unfortunately, the blame and criticism from western Germany continues in the form of criticism for the high level of unemployment in the east—they don’t seem to understand that being jobless isn’t just a matter of motivation. As “Ost’s” (Easterners) they have been told to their face by some West Germans that people in the west resent subsidizing the eastern part of the country and hold the individual East German resident’s personally responsible for it. Not only do our friends face resentment from those to their west as being financial burden, they encounter resentment from the Poles across the river that fear the German’s will buy up their property as Poland enters the EU. And the resentment comes from inside the region too. The enormous strip mining operations to remove the brown coal causes massive relocations. The people relocated after the Wende live in beautiful new homes and new communities with all the modern conveniences (though lack fine old trees and a sense of tradition). People relocated before the Wende are fuming, as they weren’t treated nearly as well by the DDR. We assume that all of these layers of resentment are in part fueled by the difficult economic times—it is easier to set such resentments aside when times are better. One form of criticism angst that is independent of the economy is that about criticizing bosses. Apparently in the DDR you could freely criticize your boss and it was almost impossible to be fired from your job. But under the DDR, criticizing the government could cost your freedom and perhaps your life. Now, just the opposite is true and some of the old DDR’ers are having a hard time adjusting to being more discreet about criticism of their employer. It’s painful to hear about the ongoing disruptions to ‘getting on with it’ in Germany. The persistent double digit unemployment levels, the animosity between various groups that inevitably arises when people are suffering, and the ongoing economic uncertainty create an uneasy environment. Reconstruction in the East has been delayed by the 15 year ‘open-season’ for people reclaiming property in the East that was confiscated by the communists. In addition, many people are living in fear of the consequences of another round of ‘outings’ of people affiliated with the much feared Stasi, the secret police. Many (but not all) of the full and part time Stasi were reported in long lists in the newspapers after the Wende (the change in governments) more than 10 years ago. But apparently there were a substantial number of Stasi embedded in West German firms and the government that were funneling money into East Germany. Those lists of West Germans financially supporting the Stasi ended up in the US to protect US spies included on the lists. Those lists are being or have been returned to Germany and will be made public much to the consternation of those who will be ‘outed.’ What a disruption to a society to have the property and reputations of so many people in a country in limbo for so long. The Wende freed our friends from feeling like political prisoners in the East Block but now they feel like economic prisoners. But despite the disappointments and challenges of remaining in a depressed region in Eastern Germany our friends are very clear that they are better off than their neighbors in Poland that are less than a mile away. On garbage day in Germany, Polish trucks cruise the streets for discarded appliances to haul back across the border for resale. Polish mushroom pickers enter Germany where the mushrooms are more plentiful as people haven’t picked the forest floor bare of the organic material that forms the natural compost in which mushrooms thrive. Their harvest is sold in Germany rather than Poland to garner a better price. And our friends are reluctant to buy the East German gasoline sold in Poland for a low price as they believe it has been watered down. But despite the decades of oppression; the shortages and poor quality of goods; and the isolation our friends are now living fully in the world. It’s hard to comprehend how their exceptional sense of humor and playfulness remained intact after so many struggles and yet it has. They are determined to leave the past behind them, including treating the ‘outed’ Stasi in their community as though nothing unusual had happened (several of whom we briefly met). While passionate and intense feelings about the past still exist they are clearly focused on living in the present with zest. Other day visitors on the Spreewald canals. Our 4 day crash course on post-war Eastern Germany was intense, but not always so serious. We spent part of one afternoon in a canal boat in Spreewald viewing the old way of life on these river island plots of land. Boats are the only mode of transportation and farm equipment, cows and crops are transported in their shallow, flat bottom boats propelled by poling. We sampled an assortment of the famous local pickles and dined on fish sandwiches. 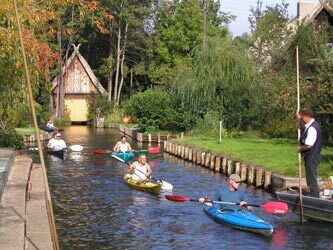 The Germans love their outings in nature but it rarely means being alone, as in the Spreewald. Fortunately we thoroughly enjoyed the festive air of our boat load of fellow sightseers and the bustle on the sidewalks on a sunny fall afternoon. Maybe I need to get out more, but even taking in an afternoon at the races in Eastern Germany made my jaw drop. We spent Sunday afternoon witnessing yet another new cultural experience, which was watching 9 pairs of bikes and motorbikes racing around a steeply banked track. These cycling dudes were flying along at 40miles/hour, pedaling like mad and drafting behind a specially modified motorbike in which the driver rests against a seat in a full upright standing position. The 9 motorbike operators all wear identical vinyl suits that look like an early Star Trek costume and have helmets with special little boxes over their ears. The ear boxes have an opening to the back to aid in hearing the desperate pleas from the cyclist about speeding up or slowing down. Cyclists drafting specially designed motorbikes at the Steherrenen races. The cyclists are on special bikes with 1 gear or speed, no brakes and the small front wheel that bumps up against a special roller bar on the back of the motor bike. Both bikers on a team are trying to go as fast as possible without letting the cyclist drift too far away on the curves, thereby losing the suctioning action they get from the upright motor biker. The race consists of 3 sets of 20, 30, and 30 km (about 12, 18 and18 miles) with about 15 minute long breaks between rounds. Kids from the area sport clubs competed in some very imaginative cycling races to entertain the audience while the 9 cyclist/motorcyclist pairs rested. I must say that I think I’ll stick to cyclotouring after seeing these bizarre races. Our home stay with our East German friends was an intense 4 day immersion in the German language and in the 50 years of modern history in their region. All of our waking hours were spent discussing the past and present affairs and it was all done in German. It was mentally exhausting for both of us though the spot light was on Bill. He was my translator though I tried my best to follow along with varying success until my mind just went blank with the effort. Bill was learning a new word every few minutes and our hosts were tireless in using examples and analogies to communicate the meaning rather than using a dictionary for help. Our host rarely gave up on helping Bill understand a new word or a subtlety between words. They only occasionally corrected his pronunciation or grammar, focusing primarily on comprehension. The corrections were very welcome buy Bill but it was nice to have them be a secondary focus. Our 4 day insider’s look into Eastern German will definitely be remembered as one of the high points of our European cycling adventures. Pant, pant…. we are scrambling to get caught-up on our long, computer-related "to do" list but with this update completed my list is one item shorter. We are in Barcelona, Spain for about a week doing some serious sightseeing on foot. I've had to hang-up riding for a few weeks to let my leg heal after a run-in with a doctor,. but you can read about that in our next update "Dark Cloud". We fly out of Madrid on 12/10 but aren't sure what we'll see between then and now.